Raised in both in Dublin Ireland and the United Kingdom and having been around horses from the age of five, I developed a wealth of knowledge in many disciplines in the equine industry, thoroughbreds, both flat and steeplechase including point-to-point eventers. At the age of 15, I entered an apprenticeship as a jockey for Palmerstown Stud, Nass Kildare, the beautiful 800 acre estate and racing stables of Anne Bullitt considered to be Ireland's first female breeders of Thoroughbred race horses. Anne's farther was William Bullitt, Franklin D. Roosevelt's first Ambassador to the Soviet Union. While in my apprenticeship, my daily duties were to exercise and condition 5 track horses that had upcoming scheduled races, this also included breaking and training seasonal colts and fillies, among other things I was a stand in assistant to the stud groom and assisting farrier. I left Dublin Ireland in 1996 and headed to the USA where I married my beautiful wife Jill from California, we now have four wonderful children. Jill who has also been in the horse industry for 35+ years, a trainer, specializing in breaking and starting colts, also re-educating problem horses, including continued training and advancement .. 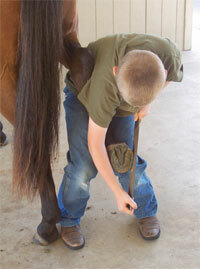 I gained my certification under Max Williams and Kelly Case of the Shur Shod Horseshoeing School in Missouri. Max Williams achieved the highest level of certification possible under the America Farrier's Association Certification Program. 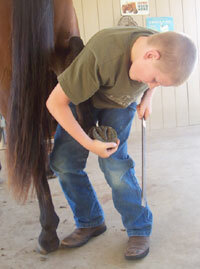 He also holds a Master's Degree in Equine Science with an emphasis on hoofcare and horseshoeing. Combined with these professional certifications and 40 years of farrier experience, teaching farrier certification in several states, shoeing horses on two continents and demonstrated forge and shoeing techniques while touring Australia, I decided that Max would be a good choice to be certified under which turned out to be a really wise choice for me, because during my certification Shur Shod Horseshoeing School was awarded the School Of The Year Award at the 2007 Brotherhood of Working Farriers Association Conference. My personal goal is to continue my farrier education/passion and if possible, work closely with some of the finest farriers and barefoot/ natural hoof care practitioners in the USA in all disciplines. My own personal beliefs regarding applying shoes vs. natural hoof care. I believe there are barefoot/ natural trimmed horses that do so much better shod for both comfort and competitive levels, just as I also believe that there are shod horses that would do much better with the natural hoof. I believe both the shod and natural hoof method, are and can be, extremely beneficial to the individual horse in it's environment and circumstances, I am not here to argue or get into a debate as to what is the correct method, shoes vs. natural hoof care, I have been very fortunate, in that I was given the opportunity to choose my profession (Farrier), be it shod or be it natural hoof, my obligations are to the horse and making them as comfortable as possible and know that they are all individual horses with individual requirements, no hoof is the same and shouldn't be trimmed the same as another, they are all very different and should be given their own unique and individual care. you can play mind games with the horses brain but you can't play around with a horses feet/hoof... my beliefs and opinions regarding shoes vs. natural hoof care ....to be continuded! All aspects of farriery, farrier science, barefoot and natural hoof care, theories methods and principles. 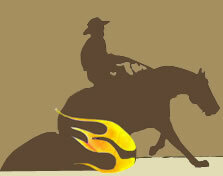 An enthusiast of the quarter horse, cutting and reined cow horse, reining and many other equine disciplines. An enthusiast of great thoroughbreds - (Red Rum) and great races, Aintree Grand National, 2¼ mile (3,600 metres) course, where challengers face 30 of the most testing fences in the world of jump racing. etc .. As a young boy, I had the pleasure of seeing Red Rum exercise on Portmarnock Beach as I was walking to my school, I saw him 2-3 times, an amazing sporting legend! Extensive knowledge and experience regarding farm and farm management with horses, sheep, cattle, poultry etc... managing a 1000 head sheep, 100 head cattle and a 34 thousand battery hen operation, also owning fullblood cattle. Web design and development, coldfusion programming. No stranger to the dog world with a long family history of founding members of different terrier breeds within in Ireland and the british isles. (Grandfather - Peter Delaney) Founder member of The Irish Terrier Club, Ireland. (Grandfather - Patrick Kelly) Wire Fox and Irish Terrier show and breed enthusiast, UK and Ireland. (Uncle - William Delaney) Founder member of The Irish Staffordshire Buill Terrier Club, also one of the top breeders of Staffordshire Bull Terriers, in show, field and hunt, including badger dog trials, having produced more game certified badger dogs than any other enthusiast within the IKC and the British Isles. I have bred shown and hunted a number of verious dog breeds over the years, hunting In Ireland and quite a number of years in the UK, in the North of England, Lancashire, towns such as, Nelson, Colne, Accrington, Oswaldtwistle etc, I feel very fortunate to have spent quite some time living and hunting among the people in the north of England, in my opinion, the strong hold of the working terrier men. I have also worked for Walt Disney productions, working with top Disney special effects team to produce the Walt Disney movie soundtrack, Jungle 2 Jungle with actor, Tim Allen, my involvement, working close with UK Reggae band Maxi Priest to help produce the Walt Disney sounding song and video called "It Starts in the Heart". by Maxie Priest, for the Tim Allen movie, Jungle 2 Jungle.